There are many considerations when deciding between renting and buying. Renting may seem like the cheaper option, but that may not necessarily be the case once you look at your possible deductions. Under the current tax laws, homeowners receive a little extra help with their expenses, courtesy of Uncle Sam. The Internal Revenue Code offers a number of sizable deductions and, periodically, tax credits for steps like improving a home’s energy efficiency. When factored into the comparison, the tax savings could make owning a home more attractive on a financial basis. As with any tax matter, check with your tax professional to determine what is currently deductible for your given financial situation before taking any action. You may need to spend a bit more time with your tax return to access home-related tax deductions, since itemizing will be necessary. In addition, using one of the self-preparation software programs could actually help ensure you deduct everything to which you are entitled. What is deductible? Here are six ways home owning taxpayers could save. 1. Mortgage interest. Currently, the interest paid on mortgages that don’t exceed $1 million is deductible, though there may be some limitations. Interest on up to $100,000 of home equity lines of credit may also be deductible for federal tax purposes. Additionally, the interest paid on a loan for a second home-including RVs, if they have cooking, sleeping, and bathroom facilities-could be deducted. 2. Real estate taxes. Property taxes are deductible on both your primary and vacation homes. 3. Points paid when borrowing. Points may be deducted on a mortgage taken out for the purpose of buying a new primary residence during the year the points were paid. Similarly, points paid on a home equity loan or line of credit where the money is used to work on the home are also deductible in the year the loan is taken. In cases where home loan funds were used to pay for other items or where points were paid as part of a refinancing, the amount is still deductible but needs to be prorated over the life of the loan. Small amounts will be allowed each year. 4. Modifications to a home for health reasons. The amount possible for deduction is a factor of income and age. However, if you need to modify a home for wheelchair access, you may be able to deduct everything from the cost of installing ramps and modifying the width of hallways to possibly a therapeutic pool. 5. Energy-efficiency improvements. 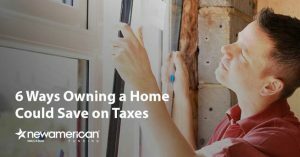 These improvements-from upgrading the efficiency of windows and doors to water heaters and the roofing material you use-could result in credits that reduce your taxes. However, the credits are subject to congressional approval, and their availability needs to be verified each year. 6. Appreciation from sale of primary residence. This may be the greatest tax benefit of all. Homeowners are able to exclude gains of up to $250,000 ($500,000 for joint filers) on the sale of their homes. The criteria is that the home must have been a homeowners’ principal residence for two of the preceding five years and the owner may not have claimed the capital gains exclusion within the prior two years. So, if you bought a home 20 years ago for $100,000 and you are able to sell it for $500,000, there are no taxes due on the sale. However, if you buy a home, fix it up, and sell it a year later, you will be required to report the profit as ordinary income. NAF and its affiliates do not provide tax, legal or accounting advice. This material has been prepared for informational purposes only, and is not intended to provide, and should not be relied on for, tax, legal or accounting advice. You should consult your own tax, legal and accounting advisors before engaging in any transaction.